Field of Dreams (1989) starring Kevin Costner is releasing to Ultra HD Blu-ray Disc. The 4k upgrade celebrates the 30th anniversary of the 3-time Oscar-nominated film, arriving May 14, 2019. 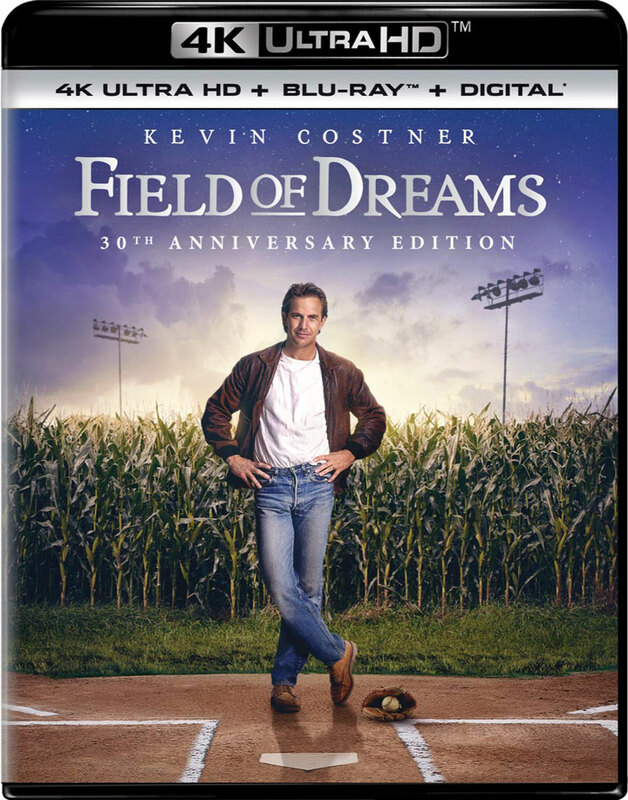 The new 4k edition of Field of Dreams from Universal Pictures Home Entertainment features 2160p video resolution with High Dynamic Range color improvements via HDR10. Aspect ratio is the same on both 4k Blu-ray and Blu-ray at 1.85:1. The soundtrack has also been upgraded to English DTS-X for immersive audio, backed by English DTS-HD Master Audio 5.1. Other languages include Brazilian Portuguese in DTS Digital Surround 5.1, and French Canadian/Japanese in DTS Digital Surround 2.0. Subtitles are provided in English SDH, Brazilian Portuguese, French Canadian, Japanese and Latin Spanish. The new 4k Blu-ray Disc includes feature commentary with Director Phil Alden Robinson and Director of Photography John Lindley. But other than that the 4k Blu-ray only holds the film itself. The second disc in this combo edition (a standard Blu-ray) includes previously-released bonus material such as deleted scenes, a roundtable discussion, and several featurettes. There is also a Best Buy SteelBook edition releasing on the same day. The limited edition from Best Buy features custom artwork of the baseball field as a constellation on the cover and back, as well as historical cornfield photo on the inside. Field of Dreams on 4k Blu-ray is now available to order from Amazon (List price $29.99) or as a SteelBook edition from Best Buy for $21.99. Backed by DTS 5.1? By definition, DTS:X includes a 7.1 backwards compatible track (which at its core should also always support 5.1 and in some cases DTS-ES 6.1) would should make owners of 7.1 systems who haven’t upgraded to Atmos/X happy since 7.1 content support was rather minimal until Atmos and X showed up leaving people who spent a lot to upgrade with systems that didn’t do much over their old 5.1 systems.